SpaceX managers called off the planned launch of a Falcon 9 rocket Sunday after identifying a potential concern during preflight testing, delaying liftoff until at least Tuesday. The scrub marked the third straight day technical issues or stormy weather have prompted launch delays. The 22-story Falcon 9 launcher was scheduled to lift off at 5:30 p.m. EDT (2130 GMT) with six lightweight communications satellites for Orbcomm Inc., a New Jersey-based company that relays data between remote assets and their owners. "Today's Orbcomm launch attempt has been scrubbed to address a potential concern identified during pre-flight checks," a SpaceX spokesperson said in a statement. "The vehicle and payload are in good condition, and engineering teams will take the extra time to ensure the highest possible level of mission assurance prior to flight," the statement said. SpaceX gave no additional information on the reason for the delay, but CBS News, citing an unnamed source, reported "the problem may have involved a component in the system used to move engine nozzles for steering during the climb to space." 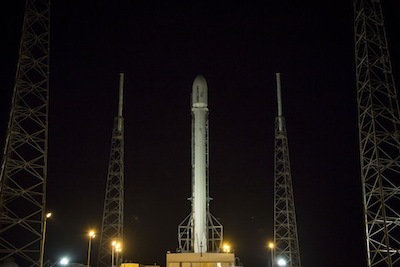 Officials said the rocket will remain vertical on the launch pad. The next available launch opportunity is Tuesday, according to SpaceX. A weather forecast issued by the U.S. Air Force called for storms and lightning during Sunday's launch window. "With conditions not appearing to change through mid-week, similar weather concerns will persist for a few days," the forecast said. The machine-to-machine communications satellites on the Falcon 9 rocket will expand Orbcomm's capacity, allowing clients to send bigger messages at higher speeds. Six spacecraft are on this launch, and SpaceX is scheduled to launch 11 more satellites on another Falcon 9 rocket before the end of the year to round out the upgraded fleet. The second-generation, or OG2, spacecraft will join the Orbcomm's 25 operating first-generation satellites and two ship-tracking satellites used by the company, according to Marc Eisenberg, CEO of Orbcomm. Orbcomm is paying SpaceX $42.6 million for the two Falcon 9 launches, a discount from the approximately $60 million per launch price advertised on SpaceX's website. Built by Sierra Nevada Corp., the Orbcomm OG2 satellites were originally contracted to fly on the smaller Falcon 1 booster, but SpaceX discontinued production of the Falcon 1 rocket and the satellites were switched to the more powerful Falcon 9. Being the first commercial customer to pay for a SpaceX launch also helped Orbcomm secure a low price for two Falcon 9 flights, Eisenberg said. Orbcomm began investing in the $230 million second-generation satellite program in 2005. SpaceX planned to launch the Orbcomm satellites May 10, but SpaceX ordered a delay after engineers saw a leak in the rocket's first stage helium pressurization system during a customary prelaunch countdown dress rehearsal. SpaceX released no additional information on the nature of the problem, or its actions to correct the leak, but Orbcomm officials were satisfied with the fix. The flight was delayed another week to June 20 to analyze a minor concern with one of the six 375-pound Orbcomm satellites on-board the rocket. The launch team aborted Friday's countdown after detecting an unexpected drop in pressure in one the rocket's second stage propellant tanks. A source told Spaceflight Now the problem was traced to a valve in a liquid oxygen tank. Another launch attempt Saturday was thwarted by lightning at Cape Canaveral.